Once a remote pioneer outpost, discover the wild beauty of Darwin by exploring it up close with a campervan hire holiday. Darwin is for many people the perfect Australia holiday destination. The city and surrounding area lend themselves to relaxation and outdoor living. Hiring a camper van is the ideal way to see it. 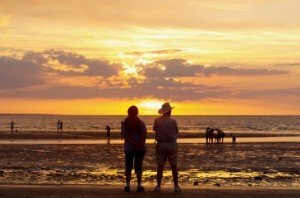 Experience the sights of Darwin including Mindil Beach with its bustling markets, great food at the Darwin Wharf Project, Nightcliff Jetty and the beautiful George Brown Darwin Botanic Gardens. Or take your motorhome for a trip outside the city to the Casuarina Coastal Reserve between the estuaries of Rapid Creek and Buffalo Creek, with its sandy beaches and the sacred Old Man Rock. With a campervan hire holiday, you don’t have to worry about missing any sights – you set your own pace and see all the different sides this stunning area has to offer, from the city of Darwin itself to the bays and beaches of the Northern Territory. Darwin’s camping parks are among the best in Australia and offer excellent facilities for both kids and adults. With vw camper van hire in Darwin you will always have the beauty of the great outdoors around you, with koalas, kangaroos, wombats and dingoes. And when you feel like moving on, the whole area is yours to explore. Not far away you will find Cullen Bay with its atmospheric sunrises and sunsets. Or head out further afield and visit Litchfield National Park with its Aboriginal sacred sites and rich wildlife including wallabies, kangaroos, possums and flying foxes. Hiring a camper means you can spend some real time discovering the natural wonders of the park, which include the Wangi, Tolmer and Florence Falls, many of which have popular swimming holes. And don’t miss out on one of the biggest attractions of the Northern Territory: its incredible and ever popular fishing. Holidaymakers come from all around the world to fish the unbeatable rivers and lakes around Darwin, whether they are experienced fishing enthusiasts or just having a go for the first time. Hiring a vw camper van in Darwin is the ultimate way to see the best of the fishing available in the Northern Territory. You can find those idyllic out-of-the-way spots off the tourist trail, and carry everything you need with you. With camper van hire you are guaranteed an exceptional level of comfort throughout your holiday, exploring Darwin with the comfort of your own transport and accommodation. If you are looking for a family holiday or want to get away to enjoy time with a group of friends, hiring an RV or camper van in Darwin will suit all types of holidaymaker. You’ll see Darwin in a way that no other holiday can show you. Spread out from your motorhome under the clear blue sky for a long picnic or barbecue. Enjoy the wildlife around you, or take a drive out into the hills to find some of Darwin’s majestic waterfalls and rivers. Campervan hire gives you the freedom to go where you want and when you want, for a holiday full of tranquillity or adventure, relaxation or excitement.